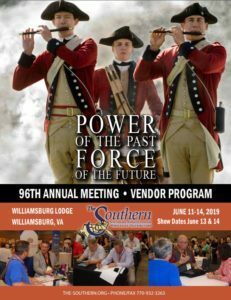 Why attend the Southern Annual Meeting? Learn from industry experts the latest profit-making techniques in small, highly interactive education sessions. Take advantage of awesome opportunities for networking with distributors, manufacturers and suppliers. Learn about the latest products and services from and conduct business with the nation’s top convenience store manufacturers and suppliers. Registration for the 2019 Southern Annual Meeting is now open. Click here to view the 2019 Register Now Brochure for more information on the meeting agenda. Please click here to start the registration process. If you have any questions, please call 770-932-3263. The Southern does NOT make your room reservations at the hotel. Please reserve your rooms directly from the hotel by clicking here or calling the Colonial Williamsburg Lodge at 1-800-261-9530. NOTE: The Southern’s Annual Meeting is a members-only event. If you are interested in becoming a member of the Southern Association of Wholesale Distributors (The Southern), please click here for more information. If you have any questions on becoming a member or need to confirm your membership status, please call us at 770-932-3263 or email us at info@the-southern.org.